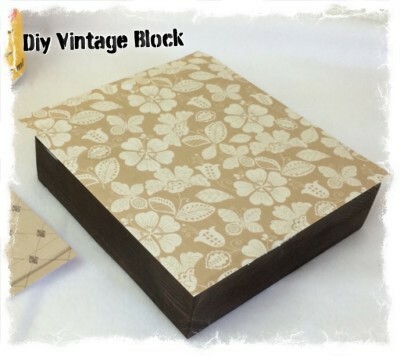 Here’s a easy Diy Vintage Wooden Block project for making vintage wood blocks with scrapbook paper (affiliate) that can be used for different projects. I got this idea from “Knick Of Time” Wood scraps and antique photographs. 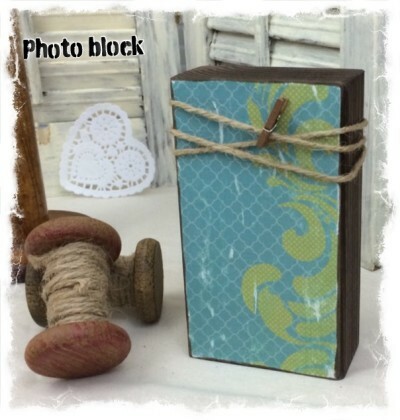 I decided to make up several for a few different projects, and I wanted to share my version of how I made these antique wood blocks, and what I did with them. 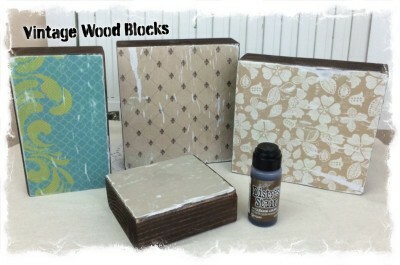 First you will want to stain your wooden blocks and let dry thoroughly. 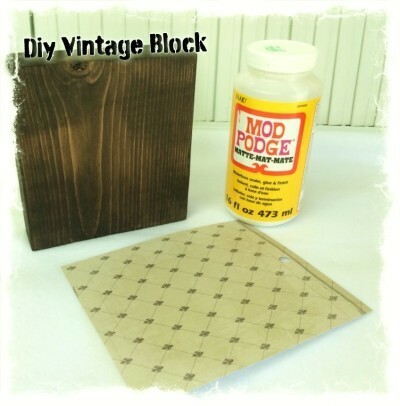 Then using Mod Podge to glue your piece of scrapbook paper onto your stained wood block. Once dry trim the excess off, then sand the edges. Now take your ink and rub it lightly on the edges of your wooden blocks. 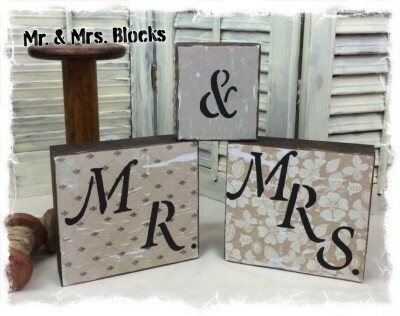 With 3 of my vintage wooden blocks I made Mr. & Mrs. Blocks by stencils the letters on top of the scrapbook paper of my blocks. The next one I made a photo holder block by wrapping some jute (affiliate) around the block a few times and tacking it down on the back. 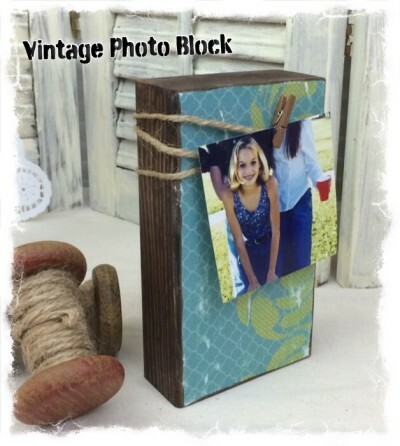 A mini wood clothes pin (affiliate) holds the photo. I love how they turned out, there is more to come. If you enjoyed this post please share, or pin for later! Thanks! One of the easiest and nice DIYs ever. Thank you! These were really fun and easy to make and there is so much you can do with them. Thanks for stopping by! Hi there! Stopping by from the My Favorite Things Saturday link party. This is really pretty! I love all the papers you chose and loved the different things you did with the blocks! Thank you Ashley! These blocks were so easy to make and there is so many different projects you could make with them. Thanks for stopping by! Very cute blocks! I love the picture holding one, so cute!! Thanks for giving a tutorial on how to make these – I’m definitely going to have to try it!! Thank you Mattie! 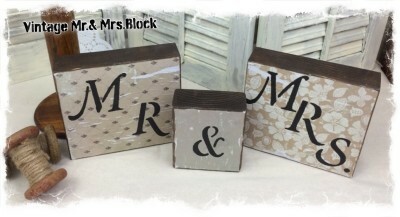 I love creating things from wood blocks, I have quite a few different tutorials made with different sizes of wooden blocks. I love them because there quick and easy projects. Thanks for stopping by! These are really cool. You are so imaginative! I love the turquoise block the best, the concept of using it to highlight a photo is really cool. The twine and the mini clothes pin put it over the top!!! Nikki Frank-Hamilton recently posted…Keep The Doors Open, Focus on the Good! Thanks Nikki! I’m sure you can tell by now that I like making crafty things from blocks of wood. There sooooo easy! These are so cute! Love how you can do so many different things with them. Pinned! Thanks Emily! 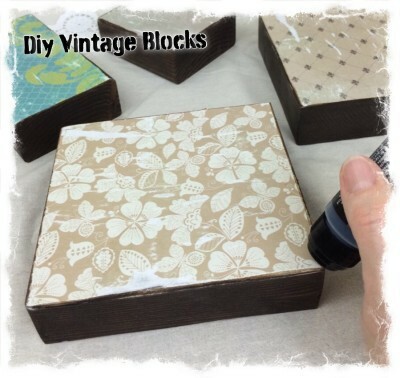 The vintage blocks are one of my favorites to make because there is so many different things you can make with them. Thanks for stopping by and pinning! Hi Linda, I’d be chuffed if I created such pretty looking blocks too. They could be used for so many things and you’d probably pay way over the odds to buy something like this. Thank you Debbie! These are so easy, and so many ways to use them. I love using them as photo display blocks. Linda the first blocks are very nice, but I am totally in love with the second one with the twine (wink) and clothespins. You made that one for me and you didn’t even know me back then. Haha. LOL, I made that one for my imaginary friend and didn’t know who that was. Now I know! That’s one of my favs too!